in the Anglo-Saxon countries and that the methods are strategically oriented. Traditional management accounting practices have been under attack for their failure to provide detailed and timely information (Cooper & Kaplan, 1991; Gosselin, 1997; Kaplan, 1984; Maiga & Jacobs, 2003). Since the work of Johnson and Kaplan (1987) on the “Relevance Lost” of management accounting practices, the Anglo-Saxon scholars have been very dynamic about the study of the diffusion of cost and management accounting innovations (Anderson & Young, 1999; Chenhall & Langfield-Smith, 1998; Cooper & Kaplan, 1991; Gosselin, 1997; Johnson, 1992). Organizations like the Cam-i (Consortium of Advanced Management, International: http://www.cam-i.org), the IMA (Institute of Management Accountants: http://www.imanet.org) and the Harvard Business School support the investigations about management accounting innovations. The ABC method appeared in this context. The ABC method was designed in the United-States during the 80’s (Cooper and Kaplan, 1988). It is a refined cost system which enables classifying more costs as direct, to expend the number of indirect-cost pools and to identify cost drivers. ABC favors better cost allocation using smaller cost pools called activities. Using cost drivers, the costs of these activities are the basis for assigning costs to other cost objects such as products or services. 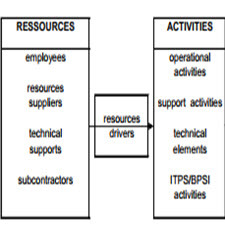 The Activity-based Management (ABM) represents a way of managing a firm with activities using the results of the ABC technic. Practically, there is a continuum between these two methods in a firm using them. شیوه های حسابداری مدیریت سنتی به دلیل ناتوانی در ارائه اطالعات دقیق و به موقع (Cooper & Kaplan، 1991؛ Gosselin، 1997؛ Kaplan 1984؛ Maiga & Jacobs، 2003) مورد حمله قرار گرفت. از آنجایی که کار جانسون و کاپلان (1987) در رابطه با “عدم توجه به اهمیت” روشهای حسابداری مدیریتی، محققان آنگلوساکسون در مورد انتشار انتشار هزینه های نوآوری حسابداری مدیریت بسیار پویا بوده اند (Anderson & Young، 1999؛ Chenhall & Langfield-Smith، 1998؛ کوپر و کاپلان، 1991؛ Gosselin، 1997؛ جانسون، 1992). سازمان هایی مانند Cam-i (کنسرسیوم مدیریت پیشرفته، بین المللی: http://www.cam-i.org)، IMA (موسسه حسابداران مدیریت: http://www.imanet.org) و مدرسه بازرگانی هاروارد از تحقیقات در مورد نوآوری های مدیریت حسابداری پشتیبانی می کند. روش ABC در این زمینه ظاهر شد. روش ABC در ایالات متحده در 80 سالگی (کوپر و کاپلان، 1988) طراحی شده است. این یک سیستم هزینه تصفیه شده است که امکان طبقه بندی هزینه های بیشتر را به صورت مستقیم، هزینه تعداد استخر های غیرمستقیم هزینه و شناسایی رانندگان هزینه را می دهد. ABC ترجیح می دهد تخصیص هزینه های بهتر با استفاده از استخر هزینه های کمتر به نام فعالیت ها. با استفاده از رانندگان هزینه، هزینه های این فعالیت ها مبنایی برای اختصاص هزینه ها به سایر اجزای هزینه مانند محصولات یا خدمات است. مدیریت مبتنی بر فعالیت (ABM) نشان دهنده یک راه مدیریت یک شرکت با فعالیت هایی است که از نتایج تکنیک ABC استفاده می کنند. در واقع، یک پیوستگی بین این دو روش در یک شرکت با استفاده از آنها وجود دارد.